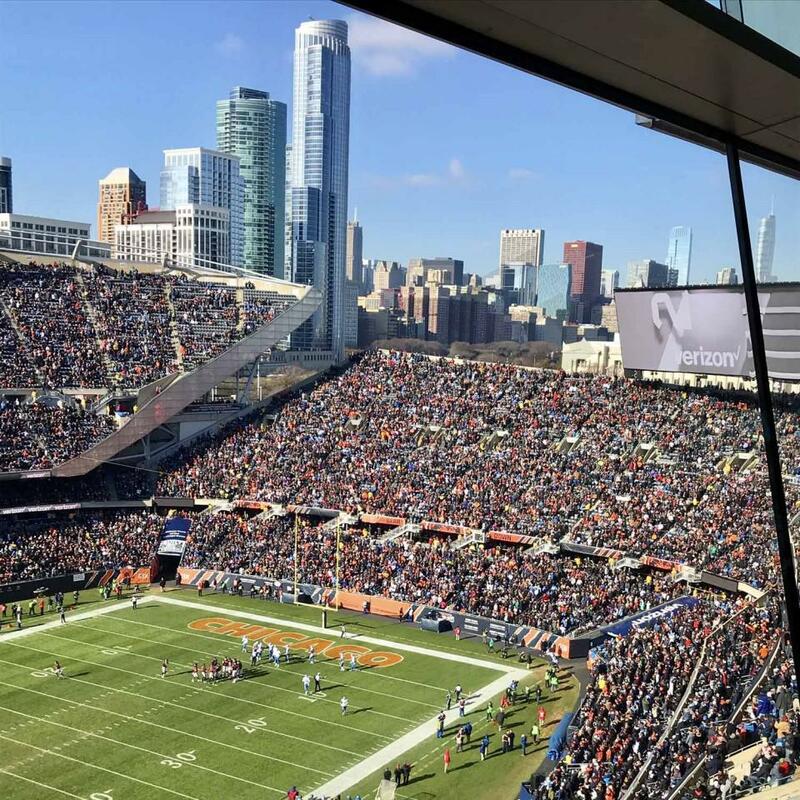 How much do Bears suites cost? Chicago Bears suite prices typically range from $15,000-$25,000 depending on opponent, team performance, day of the week, and suite level. Prime-time games played on a Monday, Thursday, or Sunday night will be priced at a premium; as will home games against divisional rivals like the Green Bay Packers or Minnesota Vikings. Chicago Bears suites feature HDTV, WI-FI, interior and exterior seating, a climate-controlled environment and upscale furnishing. With a Soldier Field suite guests will receive VIP parking and the option for premium in-suite catering brought to you by a dedicated suite attendant. Level A Executive Suites are located at the top of the first deck on the same level as the press box. Chicago Bears suites feature HDTV, WI-FI, interior and exterior seating, a private restroom and beautiful wooden furnishings. With a Soldier Field suite guests will receive VIP parking and customizable in-suite catering brought to you by a dedicated suite attendant. Level B Executive Suites are located at the top of the first deck on the second level above the press box. Chicago Bears suites come with a private restroom and refrigerator, a dedicated suite attendant, customizable catering, bar-style and stadium seating. Floor-to-ceiling windows and comfortable furnishings provide the optimal viewing experience. Level C Executive Suites are located at the top of the first deck on the third level. 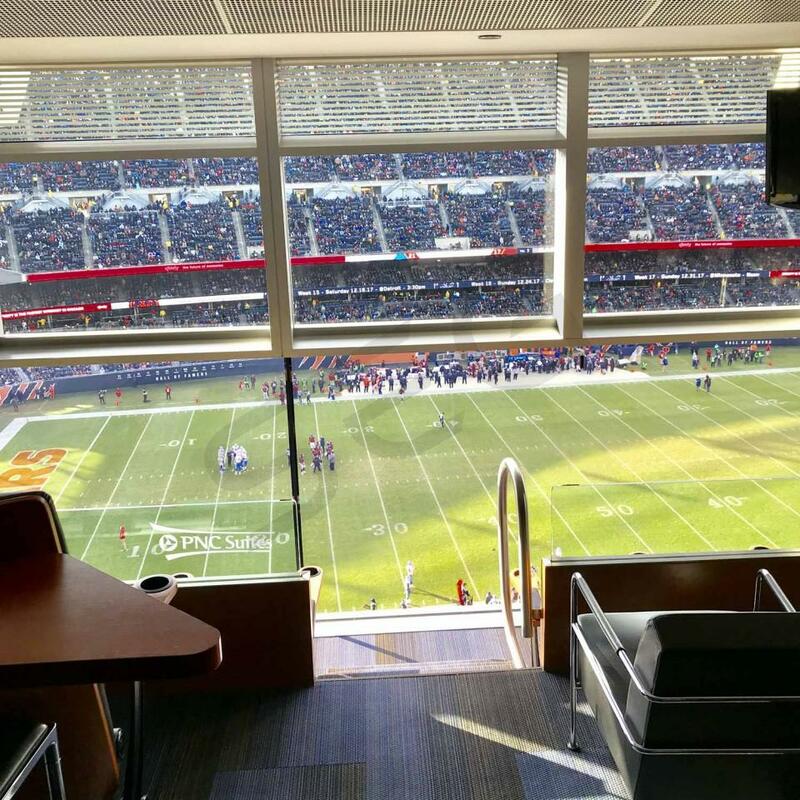 Chicago Bear Luxury Suites provide the best option to view Bears Football. The suites offer a climate controlled and luxurious environment outfitted for your viewing pleasure. The suite provides a customizable catering menu, a dedicated suite attendant, HDTV's, a private restroom plus bar-style and stadium-style seating. The new look Chicago Bears enter 2018 with a wave of optimism, looking to move out of the NFC North basement for the first time since 2013. The Bears have parted ways with former head coach John Fox and have brought in Matt Nagy to replace him. Nagy, the former offensive coordinator of the Kansas City Chiefs, will look to help second year quarterback Mitch Trubisky take the next step in his NFL career. Trubisky was drafted second overall in the 2017 NFL Draft with the expectation he would become the Bears next franchise quarterback. He showed flashes of brilliance during his rookie season, but he has plenty of work to do. It will be exciting to see if Nagy can help Trubisky take a major leap in 2018. To help bolster the offense and Trubisky’s development, general manager Ryan Pace signed Pro Bowl wide receiver Allen Robinson to a multi-year contract in the off-season. Allen Robinson missed nearly all of last season due to injury, but he is ready to prove he is back to full health and an elite receiving option in this league. The 24-year old is just two years removed from a season in which he caught 80 balls for 1,400 yards. Factor in Pro Bowl running back Jordan Howard, and the Chicago Bears offense has the potential to make some serious noise in 2018. Last year the Chicago Bears quietly had one of the best defenses in the NFL. The Bears defense finished in the top 10 in both yards per game and scoring per game. After week 4, the Bears defense allowed the second fewest offensive touchdowns in the NFL, behind only the New England Patriots. Cornerback Prince Amukamara was signed in the off-season to improve the already strong defense, joining Akiem Hicks and Leonard Floyd as the team’s best defensive players. Defensive coordinator Vic Fangio will return in 2018 looking to build on last year’s defensive success. In 2018 Soldier Field will see the Chicago Bears face off against the Detroit Lions, Minnesota Vikings, Green Bay Packers, Seattle Seahawks, Los Angeles Rams, Tampa Bay Buccaneers, New England Patriots, and New York Jets. A Chicago Bears suite features first class amenities such as HDTVs, VIP parking, interior/exterior seating, a dedicated suite attendant, and spacious floor plans. A Bears luxury box will come with the option to purchase in-suite catering. Guests who are in a Soldier Field suite will have private entry into Soldier Field and exclusive access to the Bears’ VIP clubs and lounges inside Soldier Field. Whether you are entertaining for business or with friends and family, a Bears luxury suite provides a perfect atmosphere for any occasion. Offense: In 2017, the Chicago Bears will look to compete in the NFC North division. GM Ryan Pace has continued to make changes to an old roster. In the 2017 NFL draft, the Bears traded up to select University of North Carolina Quarterback Mitchell Trubisky with the second overall pick. Trubisky brings a high upside and could be a franchise quarterback sooner rather than later. He's still young, so offseason acquisition Mike Glennon will likely open the season as the Bears' starting quarterback. Fans have every reason to be optimistic for Trubisky's development behind Glennon. Overall, the Bears enter 2017 with a solid offense - offseason acquisitions at wide-receiver, specifically Kendall Wright and Markus Wheaton, will supplement former first-round pick Kevin White and breakout performer Cameron Meredith. Fans should expect a big season from second year running back Jordan Howard. Howard burst onto the scene last season and solidified himself as a three-down back and capable homerun hitter. The Bears' offense should take a significant step forward in 2017. Defense: When you think about the Chicago Bears, you think about defense. In 2017, the Chicago Bears will need their defense to improve if they plan to contend in the NFC. The Bears will return leading tacklers Danny Trevathian and Jerrell Freeman. These middle linebackers represent the biggest strength of the Bears' defense. Outside linebacker Leonard Floyd, a former Georgia Bulldog, showed promise in his rookie season. He will need to contribute as a pass-rusher to ease the burden on Chicago's secondary. Chicago will look to rookie safety Eddie Jackson to play immediately in the secondary. Schedule: In 2017, the Bears will see the following teams visiting Soldier Field: Detroit Lions, Green Bay Packers, Minnesota Vikings, Atlanta Falcons, Pittsburgh Steelers, Carolina Panthers, San Francisco 49ers and Cleveland Browns. 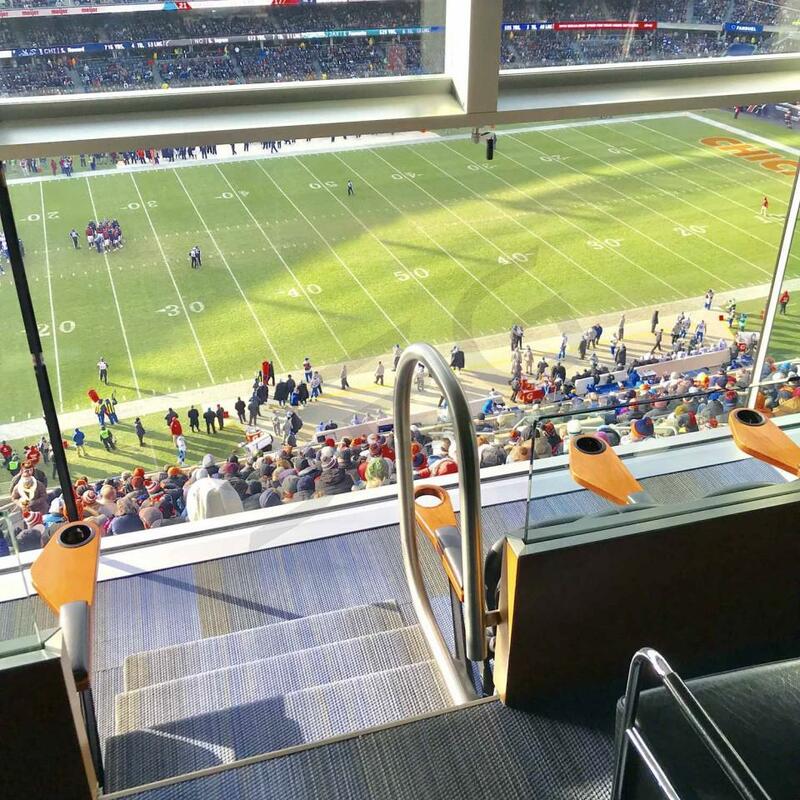 Suites and Special Events: A Chicago Bears suite features first-class amenities such as HDTVs, VIP parking, interior/exterior seating, a dedicated suite attendant and spacious floorplans. A Bears luxury box will come with the option to purchase in-suite catering. Guests who are in a Soldier Field suite will have private entry into Soldier Field and exclusive access to the Bears’ VIP clubs and lounges inside Soldier Field. Whether you are entertaining for business or with friends and family, a Bears luxury suite provides a perfect atmosphere for any occasion. Special Events at Soldier Field this year consist of: U2, Metallica, Coldplay, and the MLS All Star game. Offense: After hiring John Fox, the Bears had playoff aspirations in 2015, but sadly things didn't go quite to plan as the team finished with only 6 wins. After adding to the defense the Bears believe they can make the playoffs again but that will require a big jump in production from their offense. Jay Cutler was very efficient last year under new offensive coordinator Adam Gase but they will likely need him to throw for over 30 touchdowns, which would be a 10 touchdown jump. Luckily for Cutler and the Bears, they have massive wideout Alshon Jeffery on the roster. Although Jeffery struggled in 2015 as he worked through leg injuries in his most recent healthy season he was an All-Pro. Fans should expect big-time numbers from him once again. The Chicago Bears best back is Jeremy Langford who hasn't shown big-time production yet but will likely have a productive year. Defense: When you think about the Chicago Bears you think about defense but interestingly enough the Bears have struggled on the defensive side of the ball. In the offseason the Bears made a strong effort to improve the defense by adding middle linebackers Jerrell Freeman and Danny Trevathan. Both backers had over 110 tackles in the 2015 season so the Bears should improve significantly in the run game. In the first round the Bears selected outside linebacker Leonard Floyd, a former Georgia Bulldog, with the ninth pick. If Floyd lives up to his massive potential he will be a constant annoyance in the back of the opposing quarterbacks mind. Schedule: In 2016, the Bears will see the following teams visiting Soldier Field: Detroit Lions, Green Bay Packers, Minnesota Vikings, Tennessee Titans, Philadelphia Eagles, Washington Redskins, San Francisco 49ers and Jacksonville Jaguars. 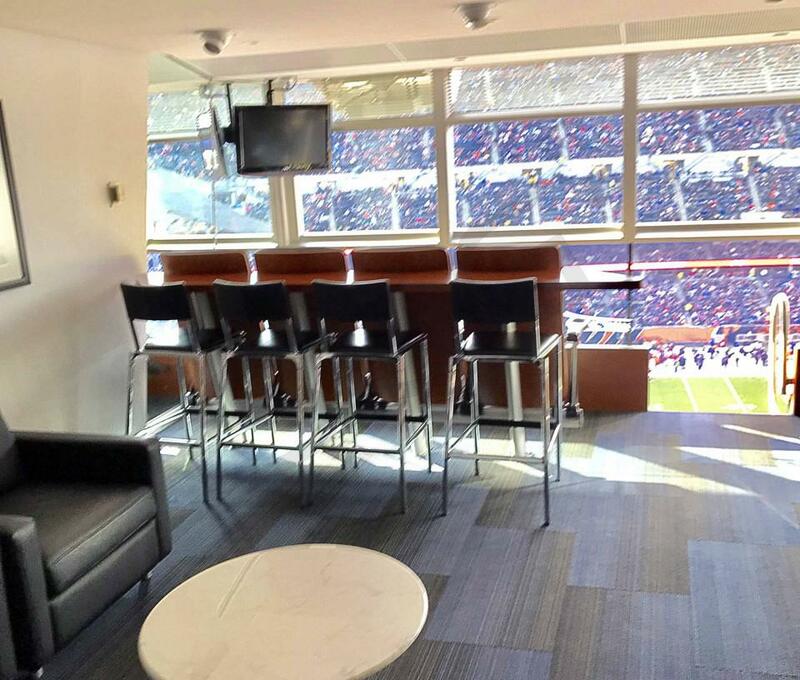 Suites and Special Events: A Chicago Bears suite features first-class amenities such as HDTVs, VIP parking, interior/exterior seating, a dedicated suite attendant and spacious floorplans. A Bears luxury box will come with the option to purchase in-suite catering. Guests who are in a Soldier Field suite will have private entry into Soldier Field and exclusive access to the Bears’ VIP clubs and lounges inside Soldier Field. Whether you are entertaining for business or with friends and family, a Bears luxury suite provides a perfect atmosphere for any occasion. Special Events at Soldier Field this year are the USA Women's Soccer Team vs South Africa, Coldplay, Guns N Roses, Bayern Munich vs. AC Milan soccer and Ireland vs. New Zealand rugby. Thank you for signing up for specials at Soldier Field. Enter your email address below to stay in touch. We'll sign you up for our newsletter, which will inform you of the latest inventory and events at Soldier Field. We promise we will never sell or distribute your information. 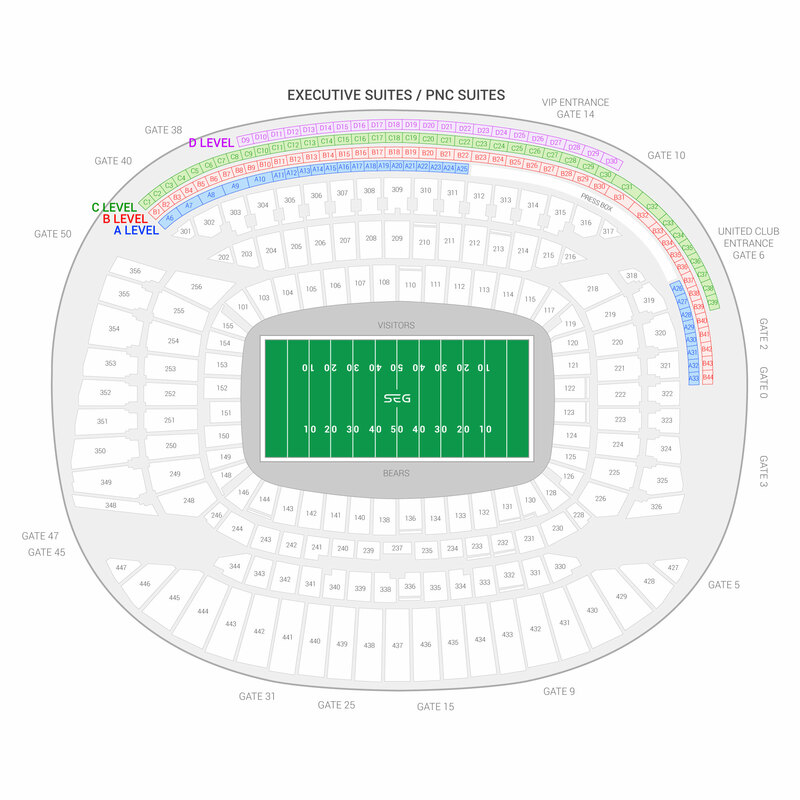 The seating chart below shows where the Chicago Bears suites at Soldier Field are located.